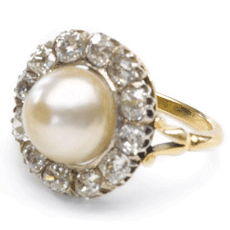 A natural pearl surrounded by twelve cushion shaped old-mine cut diamonds in a cluster. Mounted in silver and gold. Each diamond is approx. 0.80 carats. Warm silver overtone natural pearl approx. 13mm with high dome.